Trusts are an important part of estate planning as they allow you to ensure that assets can be ring-fenced and managed by trustees. Let's consider a few good reasons to use a trust. Trusts are flexible, allowing you to tailor them to the needs of your own situation. Do you have a beneficiary who doesn't have the capability (minor or disabled) or desire to manage the assets? Do you not trust the beneficiary to own the asset outright (perhaps because they are spendthrifts)? Do you believe that there could be a possible conflict between heirs when their estate is settled (perhaps between children from different marriages)? Through a trust, managed by trustees, those assets can be distributed to the beneficiaries over time. Placing assets in certain types of trusts can protect them from creditors, marriage breakdown or from those who might influence beneficiaries. A discretionary trust would offer protection as the beneficiary has no right to the proceeds until the trustees appoint them. But as a beneficiary is fully entitled to the proceeds under a bare trust, there is no such protection. People believe that the main reason for using a trust is to mitigate or eliminate inheritance tax. Simply put, assets that are placed into trusts are given to the beneficiaries and are no longer part of the settlor's estate, provided the settlor survives seven years. Even if the settlor dies within seven years only the value of the gift is included within their estate, meaning that from day one the growth is outside. 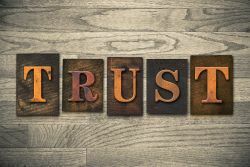 As assets within a trust don't belong to the settlor, in the event of their death the value of the asset is not included in the estate for probate purposes, which can mean substantial savings in time, legal fees and paperwork. Also, when dealing with life policies the insurance provider will be able to pay the death benefit quicker as they can pay the surviving trustees (legal owners) and don't require the grant of representation – this can happen in a matter of weeks. Trusts are set up for a variety of reasons and are a useful estate planning tool. Choosing the right one is crucial and this is where professional advice is beneficial.